Let us promote your website on all major Greek Search Engines! In order to be featured on Greek search engines, it is necessary that your website is localized in Greek, either partially or entirely. Greek website localization refers to the process of translating your current website into Greek, conducting Greek keyword analyses, implementing Greek SEO, and integrating the localized Greek pages onto your website so that you can have eligibility to rank on Greek search engines. Our work speaks for itself! Our clients rank on the first page of Greek search engines with their industry’s most competitive keywords. Let us show you how Greek website localization can position your website on Greek search engines! Contract our Greek experts to create an entry page, multiple pages, or a full-website translation in Greek for your website optimized with your Greek keywords/meta tags. As a multilingual SEO company, our primary focus is to deliver culturally and semantically accurate translations while aiming to maximize organic-rankings of targeted foreign-keywords. Greek has a documented history of 3,500 years, the longest of any single language within the Indo-European family. It is also one of the earliest attested Indo-European languages, with fragmentary records in Mycenaean dating back to the 15th or 14th century BC. Today it is spoken by about 13 million people in many countries all over the world. In the United States alone, there are over 325,000 Greek-speaking individuals. Although, Greece today is not the gigantic empire it once was, it is still an economically strong country with a total population of about 11.2 million people and a GDP of 249 billion dollars. Although the number of Greek speakers in the world is fairly low compared to other languages, the Greek speaking population represents an important portion of the European market. 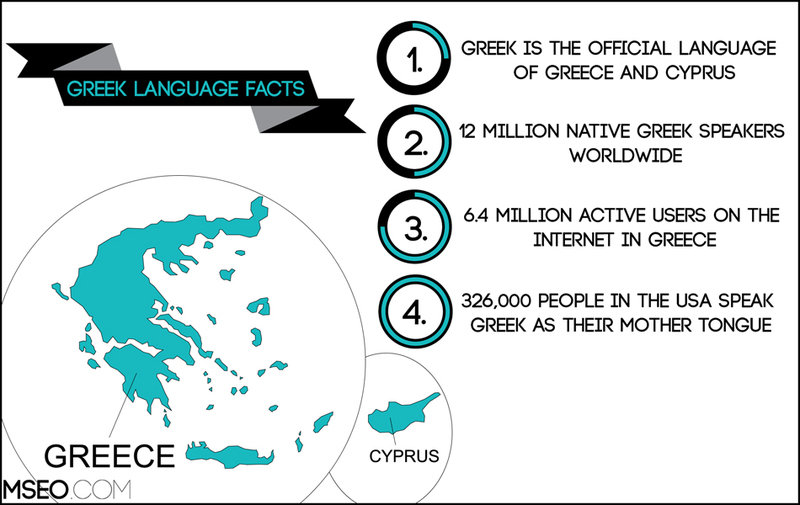 Concerning the Internet, there are around 6.8 million Greek-speaking people online (as of November 2015) in Greece,which represents a 46% language penetration of the population. Get a quote to localize your website into Greek today!